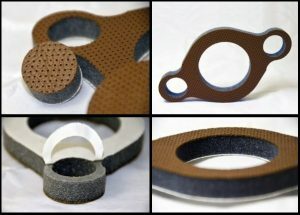 Cold bonding for finished gaskets joins cut lengths of rubber without the use of heat. This bonding technique isn’t performed under low-temperature conditions but is manual process that requires a brush and glue. 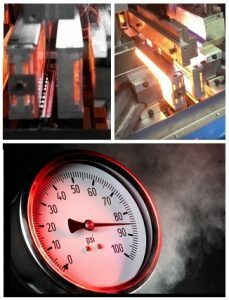 By contrast, injection molding is a semi-automated process that uses a C-press machine with a heated barrel, metal plates, and tons of pressure. To join cut lengths, uncured rubber is used. 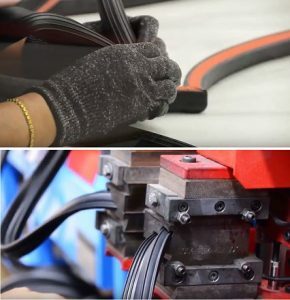 Hot splicing uses heat, pressure, and a film splice to join the ends of rubber profiles into bonded gaskets. This joining technique uses either a conventional heating source or infrared (IR) light and polyethylene (PE) film. Hot splicing creates strong bonds at the molecular level and generally provides better results than vulcanization, a bonding technique that uses uncured rubber instead of a film splice. Choosing the best way to bond rubber gaskets can be a complex decision, however. The profile material is just one of many considerations. You also need to consider the size and shape of the seal, production quantities and costs, and the way that lengths of rubber are cut. In addition, it’s important to inspect and install your gaskets properly to ensure reliable sealing and prevent avoidable waste. What’s the Best Way to Bond Rubber Gaskets? 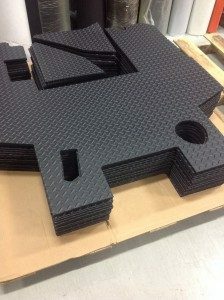 Rubber profiles come in lengths that are cut-to-size and fabricated into finished gaskets. Examples include picture frame or bezel gaskets, O-rings, and gaskets with rounded corners. 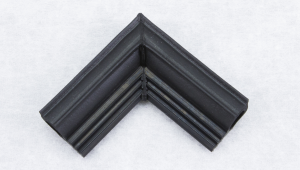 There are four ways to bond or join the ends of rubber profiles. Rubber floor mats for mobile equipment protect cabin floors from damage and operators from slip-and-fall hazards. Rubber flooring that’s laminated to acoustic insulation also absorbs noise from the engine compartment, which is often directly below the cab where the operator sits. 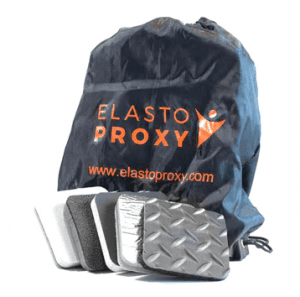 Rubber matting can even be used as a kick-plate to protect cabin walls from contact with an operator’s boots. 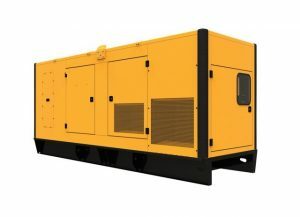 For mobile equipment manufacturers, choosing the right type of cabin flooring is an important design consideration. The metal floors that are used inside a cab are durable, but operators track mud, snow, dirt, and water inside. Rubber floor mats can protect these metal surfaces from rust, corrosion, and scratching. Sheet metal flooring can become slippery, but rubber surfaces can offer surer footing. Custom cab insulation absorbs sound and provides a finished appearance to mobile equipment interiors. This acoustic insulation can be cut by hand and applied with spray adhesives, but that process is expensive, wasteful, and even hazardous to human health. Plus, manual cutting can result in cabin insulation that’s unappealing. Buyers who see mis-cuts may question the quality of your overall equipment design. As mobile equipment manufacturers are discovering, there’s a better way to design and build quieter cabs. Custom-fabricated insulation that’s waterjet cut creates straight lines and chamfered angles. There’s less material waste, reduced cutting times, and closer control of material usage. Engineers can also get design assistance and help with material selection. Installers can avoid messy, toxic spray adhesives.